Fig.1 NACA0012 airfoil model with synthetic jets. Fig.2 Enlarged view of synthetic jet cavity. Fig.3 Lift and drag coefficients at Re=1.5×105. 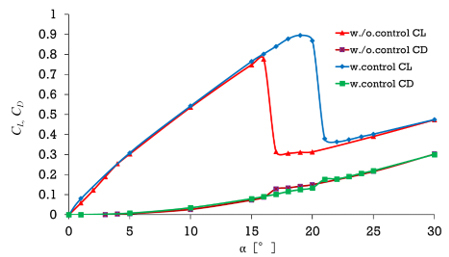 Fig.4 Time history of lift coefficient when our active stall control system operates to the time-varying flow fields (Re=1.5×105). (2) Johnston, J. P., Pitched and Skewed Vortex Generator Jets for Control of Turbulent Boundary Layer Separation: a Review, 3rd ASME/JSME Joint Fluids Engineering Conference, FEDSM 99-6917（1999）. 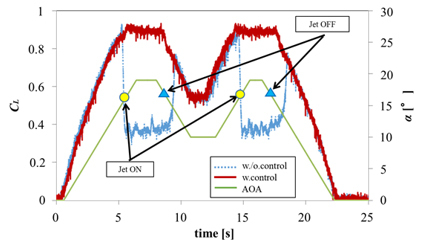 (4) K. B. M. Q. Zaman, Effect of Acoustic Excitation on Stalled Flows over an Airfoil, AIAA J. 30-6（1992）, pp. 1492-1499. (7) Glezer, A. and Amitay, M., Synthetic Jets, Ann. Rev. Fluid Mech.,Vol.34（2002）, pp. 503-529.